One of my favorite times of the day is in the early morning, shortly after rising. It is with great anticipation that I shuffle to the kitchen and turn on the coffee maker which was prepared the day before. Then I head back to the bathroom to do the daily rituals, brushing teeth, washing my face, etc. No waiting whatsoever, just pour the cup of brew and it’s made to perfection! Sitting in my favorite comfy chair while savoring my coffee, enjoying the peacefulness of early morn, is one of the highlights of my day. It’s relaxing and very enjoyable and a great way to start my day! With the excitement of our trip to the southwest this winter, I have visions of enjoying my early morn coffee while taking in the beautiful Sonoron Desert or perhaps a desert sunrise that is absolutely breath taking! When I close my eyes and imagine the scene, I can almost experience it and I know it is going to be awesome! In the January 2017 issue of Motor Home magazine, they asked several RV travelers “which everyday household items do you carry along in your motor home to help make life on the road easier?”. 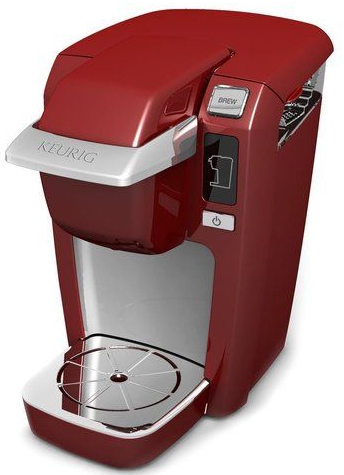 The Keurig coffeemaker was mentioned twice in the article. I found this amusing that there are others who feel like I do! Yes, I am one of those people that carry a Keurig coffee maker. One response said that the “Keurig is an essential for life in a motorhome”. Though I don’t use the Keurig at home, I do like the convenience of it when camping. It is so easy to use, takes only one minute to brew a delightful cup of java and there is no clean up! Yes, I do like my Keurig! I think the Keurig is awesome! However, as stated in the article, the Keurig uses 12 amps when it is heating the water. In the past when we have boondocked, I made coffee using one of the inverter outlets in our motor home. And yes, it does drain the battery, as we have witnessed while monitoring the battery levels. By the time I make the third cup of coffee, the low battery alarm sounds when the Keurig is heating the water. So the reality of it is…the Keurig and boondocking do not mesh! Since we plan on doing a lot of boondocking, I realize I need to change my old habits. My dear friend in Florida swears by the Melitta filter cone that brews one cup at a time. This is how she makes her perfect cup of coffee! Emily from the blog, RoadsLessTraveled has good things to say about the Melitta Brewing Cone as well. So I broke down and ordered one from Amazon. 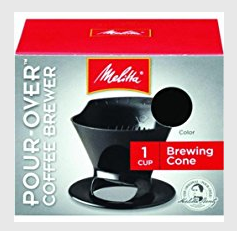 The day I received the Melitta Brewing Cone I was excited to try it out. I withheld from doing my usual routine of making coffee the day before. The next morning before dawn (I’m an earlier riser) I moseyed out to the kitchen to turn on the coffee maker only to realize that this was the day to try out the new system. So I put on a kettle of water to boil and marched back to the bathroom to perform the daily rituals that I mentioned before, brushing teeth, etc. Then back to the kitchen where I patiently waited to hear the sound of the kettle whistle. I began pouring the water slowly into the filter and holy cow, it was a slow process! So I poured a little faster, but that caused the water to pool up. The filter had a mind of its own and dripped as its own pace! When all was done, I did have a nice cup of coffee. However I did feel a little frazzled because it took 5-6 minutes for the coffee to brew, not counting the time the water takes to boil! If I only had one cup of coffee per day like my dear friend, then it wouldn’t be so bad. I managed to use this method for a few days, but was very happy to get back to my normal routine. I am not giving up on the Melitta Brew Cone! I’ll be taking it and plan on using it. Perhaps I’ll learn some patience or discover that my morning coffee is even more enjoyable. I’m thinking positive here, folks! As of yet, I haven’t decided whether I’ll be bringing along the Keurig. We’ll wait and see! This entry was posted in Getting Started and tagged Boondocking, Coffee, Keurig, Melitta. Bookmark the permalink.